Professional family run removal and storage company based in Dundonald, Ayrshire. We operate custom built furniture vehicles and have a 30,000 sq foot modern storage centre. We are fully insured and members of BAR (British Association of Removers). 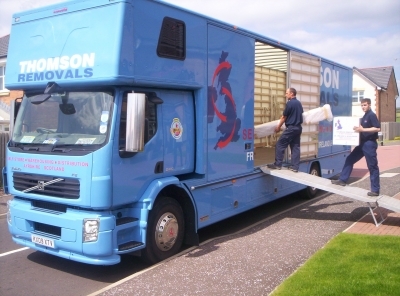 We undertake business and commercial moves and domestic/household removals. We provide a wide range of packaging materials for sale. We have plenty of storage space available and are also open to the general public for self storage. We do have office / business storage facilities. Piano specialists. Porter hire available. As well as our removal and storage services we do provide a warehouse service to commercial customers and have over 4,000 pallet locations with onsite warehouse men/ fork lift operatives. Dock levellers are in place for decanting shipping containers.